General Sam Houston (a Presbyterian) secured the future of the newly-minted Republic of Texas in April 1836 when he defeated the Mexican army in the Battle of San Jacinto. In the aftermath of war, land promoters founded a new town about 25 miles west of the battle site and called it “Houston.” Two years later, Rev. William Y. Allen arrived in the fast growing town, which was then serving as the capital of the Republic of Texas. Allen was born and educated in Kentucky, studied at Princeton Seminary, and made his way to Texas as part of a push by the Presbyterian Church in the U.S.A. into the new nation, “one of the most interesting and promising missionary fields on the face of the globe” at the time. Rev. Allen established a Sabbath School in Houston in May 1838, and on Easter Sunday 1839, Allen helped organize the first church in the town, surpassing the Episcopalians in their organizing efforts by just one day. Economic troubles, a yellow fever epidemic, and the removal of the state capital to Austin challenged both the town and the new Presbyterian congregation, but Rev. Allen and his flock persevered. First Presbyterian Church continues to thrive today. During the last quarter of the nineteenth century, Dwight L. Moody became one of the most famous and influential evangelists in the world. Moody, however, did not attend college or seminary and was never ordained. Some Presbyterians condemned his style of preaching and the large crowds of adherents he drew as an example of the blind leading the blind. In 1880, Rev. William H. Vernor, stated clerk of Brazos Presbytery (Presbyterian Church in the U.S.), arranged for the publication of a pamphlet addressed to the “free thinkers of Houston, Texas.” Rev. Vernor proudly declared that, “The Presbyterian Church in Texas is now, and has been, for two years happily free from lay Evangelists [like Moody] and singing woman—ecclesiastical tramps—who belong to no Presbytery, or other ecclesiastical body, to whom they are responsible. I take pleasure in remembering that I assisted, in some measure, in throttling this monster of Lay Evangelism in the Synod of Texas.” Most of the sixteen pages of his printed sermon are devoted to a detailed analysis of scripture, which Rev. Vernor argued was divinely inspired. Rev. Vernor himself had worked as an evangelist in Houston in 1878, and he spent most of the last ten years of his life as a Bible agent based in Little Rock, Arkansas, so he was not as “traditional” as one might suspect. His pamphlet, however, points to some profound tensions within American Protestantism, differences that began to coalesce as the Fundamentalist-Modernist controversy of the late nineteenth and early twentieth century. Rev. Harry Adamson introduced Long Distance Learning at the Telephone Lecture Series in 1971, from Growing in God's Grace, MDPC at Fifty, p. 55. Long distance learning in the early 1970s? At Memorial Drive Presbyterian Church in Houston, Rev. Harry Adamson pioneered the concept of live, long distance learning when he started the Telephone Lecture Series in 1971. Audiences of around 200 would gather in the Fellowship Hall to listen to prominent theologians from around the country present classes via the phone—with audio piped in through loudspeakers. Rev. 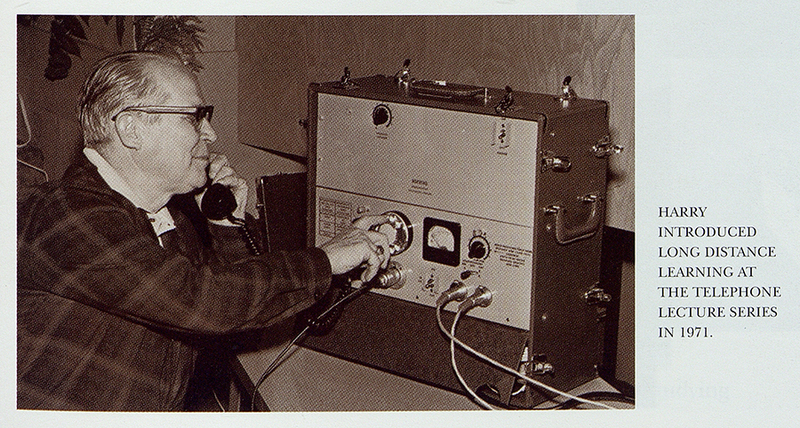 Adamson’s technology allowed audience members to ask questions and engage in dialogue with the people on the other end of the line. In 1974, the PCUS Presbytery of Brazos elected Nellye Joyce Lewis Punch as the presbytery’s next moderator. Mrs. Punch was the first woman and first African American lay person to serve in that role. She was a longtime member of Pinecrest Presbyterian Church, Houston’s oldest African American Presbyterian congregation. Rev. J.H.M. Boyce, the first pastor of Pinecrest, had been elected as the first African American moderator of Brazos Presbytery in 1955. 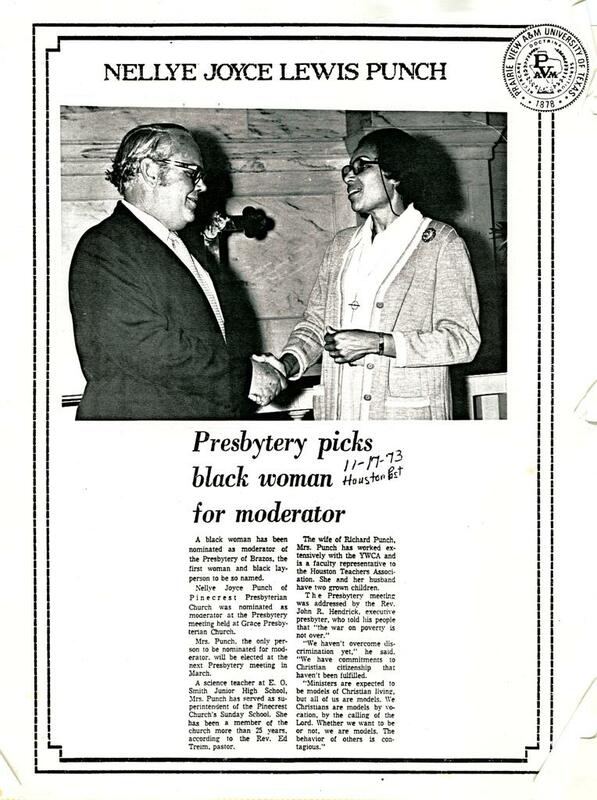 N. Joyce Punch, on right, the first woman and first African American lay person nominated as moderator of the Presbytery of Brazos, Houston Post, Nov. 17, 1973.